Today I launched the RasPiO Pro Hat on Kickstarter. It’s a Raspberry Pi Hat for GPIO tinkering (it goes perfectly with GPIO Zero). It arranges the GPIO ports in numerical order around a mini-breadboard, which, to my knowledge, has not been done before. If the RasPiO Pro Hat looks interesting to you, please consider backing the project. Alex’s Awesome Alliteration _Also_ ? P.P.S. 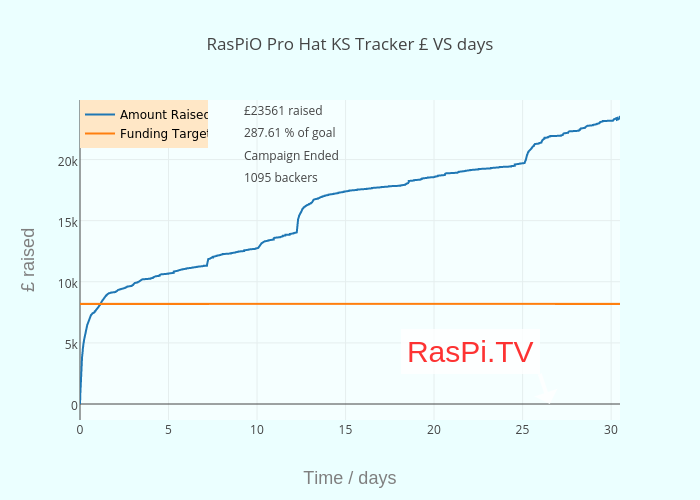 I wonder how similar a shape the “RasPiO Pro HAT KS Tracker backers VS hours” graph would have? Is portsplus included in Pro Hat? Why do you need Portsplus if you have Pro Hat? I support your Twin package but could not support Portsplus package too because only one selection possible in kickstarter. I had to order separately Portsplus because I cannot pledge you two times. It would be great to have a package where you get portsplus + Pro Hat + ruler. A few people have asked. What normally happens is, rather than make it really complex and add a bunch of new reward levels, it’s better if people just add £2 to their pledge and let me know. Then I make a note in their record, which gets picked up at shipping time. When we print the labels, the code goes on the label so we know to add extra item(s). But I see you bought a Portsplus from rasp.io/portsplus so that’s fine too. That will be shipped on Monday. What do you think if this hat could also be useful in FPGA logic development for RB2B? It would be so great to get FPGA functionality into RB2B low cost. Yes, I know it is the common thought RB2B is not sufficient FPGA development, since it has not been designed for that originally. Many attempts found in Google are just attempts but none can estimate how complete/sufficient they are in mature FPGA functionality. However, I am interesting how well it could be sufficient in theory. I asked for order details about Dave’s CAT board. It worries me that these projects for FPGA and also the Pro Hat is backed by single person. I think the Pro Hat can help in analysing the usefulness of RB2B for FPGA. I will provide my experience, when I get the components from Pro Hat, Dave’s FPGA and SnickerDoodle + piSmosher SBC, about the FPGA with RB2B and/or SnickerDoodle and their integration if limits reached in FPGA functionality in RB2B. When I said “IMHO this isn’t suitable for FPGA development” I meant the ProHAT described here has nothing ‘special’ making it suitable for FPGA development – it’s “just” a generic GPIO breakout board (with no offence meant here to Alex). It sounds to me like you’re over-estimating what the RasPiOProHAT does? Hi. How can I send a photo with my Pro Hat ? Thank you. I’m not quite sure what you’re asking for, but does https://www.raspberrypi.org/learning/getting-started-with-picamera/ or https://www.raspberrypi.org/learning/tweeting-babbage/ help?